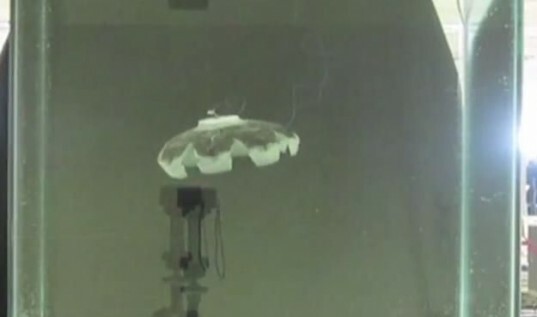 A team from Virginia Tech has created the Robo-Jellyfish, a swimming robot that is powered by a hydrogen-based catalytic reaction. This robot has not only the ability to power itself indefinitely, but it could transform how underwater craft are propelled — remember that many ships and submarines are currently nuclear-powered. If you watch the below video, you will see that the robot is very realistic in the way that it moves. It is not surprising to learn that its creation is thanks to state-of-the-art engineering which, according to a report in Smart Materials and Structures, sees the jellyfish’s body constructed from nano-platinum catalyst-coated multi-wall carbon nanotube sheets wrapped around a nickel-titanium shape memory alloy. When the platinum catalyst layer makes contact with a mixture of oxygen and hydrogen gases, heat is released that causes the memory alloy to change shape and propel the robot through the water. 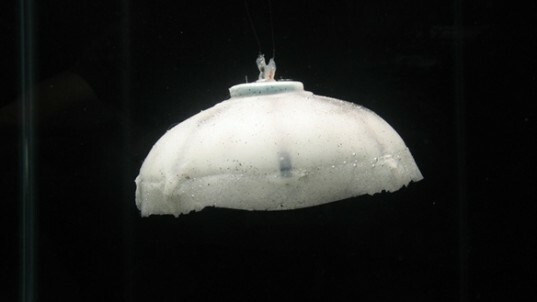 This allows the jellyfish to constantly move without the need for an external power source. Unfortunately, the robot in the video is an electrically powered prototype, as the chemical power source is currently being ‘refined’. Unsurprisingly, the Office of Naval Research is very interested in the breakthrough. It probably also helps that they are footing the bill. Perhaps in a few years time we’ll see unmanned underwater ‘squidies’ monitoring pirate-infested waters or drug routes. A team from Virginia Tech has created the Robo-Jellyfish, a swimming robot that is powered by a hydrogen-based catalytic reaction. This robot has not only the ability to power itself indefinitely, but it could transform how underwater craft are propelled -- remember that many ships and submarines are currently nuclear-powered.